Award winning chef Patrik Jaros has chosen to take on cooking in the modern kitchen. The idea was to develop a concept that would allow anyone with little cooking knowledge to make fantastic meals and cocktail creations using detailed instructions. Important information about ingredients and food should also not be missing. And all this should be available on-the-go. 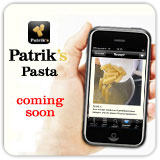 The result is „Patrik’s Food & Beverage Apps“. Cooking applications for the young modern kitchen with never seen advantages. 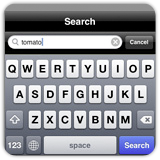 The new applications surprise through practical cooking knowledge and delicious recipes. The photographic documentation showing all the individual steps until the meal is finished turns cooking into a breeze. Independent of whether you have an iPhone, G1, a Blackberry Storm or a different Smartphone with touch screen function: The recipes, cook books and food encyclopaedia created by head chef Patrik Jaros can now very simply be loaded onto your mobile phone. Using clearly structured categories as well as a comfortable search function you can always find the right recipe to match the content of your fridge. 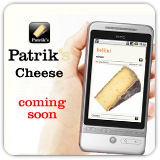 Try the new mobile recipe applications now and you will surprise yourself and others as a chef. No more shopping lists: The aesthetically photographed ingredients with information on required quantities for your meal are now with you all time. Whether you are in the supermarket, a café or on the underground – without requiring an internet connection. No more ”dog ears“. Under the section “favourites“ you can earmark and call up all your favourite recipes. ”Send to a friend“. Send your favourite recipes as mail while on the go using the function ”Send to a friend“ – or print it for its use in the kitchen. Selected recipes: The successful award winning chef Patrik Jaros guarantees you selected premium recipes that he has created himself. Trust the expertise of the Witzigmann-Scholar for all the recipes on your mobile phone. Hereby trial and error will become an experience of the past. Quick search. Well arranged sections allow you to quickly find the desired recipe and required explanations. The practical search function not only allows you to find your favourite recipe but also to find a recipe that matches the content of your fridge. Simple explanations. The photographic documentation of the most important recipe steps as well as accompanying movie clips visualise what is required to complete your dish. It can look just like this in your kitchen. Nothing stands in the way of your success.